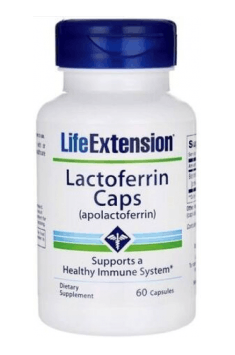 Life Extension Lactoferrin Caps is a dietary supplement composed of bovine lactoferrin in the patented form, Bioferrin®. It has been obtained from cow's milk in a technologically advanced production and purification process. It provides as much as 95% of the so-called apolactoferrin, i.e. iron-free lactoferrin. The preparation has an extremely wide range of health-promoting properties. It positively affects the functions of the immune system and supports natural immunity. In addition, it has antimicrobial and antiparasitic effects. It also helps to reduce inflammation in the body and reduce the number of free radicals. It promotes the health of the skeleton and improves the condition of the intestines. It is gentle to the stomach and does not cause discomfort in the digestive system. Lactoferrin is a type of transferrin glycoprotein. It is naturally produced in the human body and found in all body fluids and secretions. Its highest concentration occurs in colostrum (milk collected and secreted in the last days of pregnancy and the first days of lactation). The key property of lactoferrin is the ability to chelate iron ions. Lactoferrin itself may be saturated with iron, but there is also a variation of it – the so-called apolactoferrin, which does contain iron ions. It has much stronger antimicrobial properties because it does not provide free iron, which is an ideal nutrient for bacteria. Lactoferrin favorably modulates the immune response of the body. It directly affects cells of non-specific and specific immunity – promotes maturation and differentiation of B and T lymphocytes, stimulates the activity of macrophages and NK cells. It may also increase the effectiveness of phagocytosis. In addition, it promotes the reduction of pro-inflammatory cytokines and stimulates the production of anti-inflammatory cytokines. Thus, it protects against chronic inflammations which may be the cause of the development of numerous pathogenic processes. Lactoferrin has a bacteriostatic and bactericidal effect. It is effective against both Gram-positive and Gram-negative bacteria. By capturing and binding iron ions, it makes them inaccessible to pathogenic microorganisms. This is important because iron is an excellent nutrient for bacteria and is used, among others, for creating biological layers. Lactoferrin is also capable of directly interfering with the metabolism of bacteria and destroying their cell walls. It has also been proven that bacterial mobility increases in the presence of lactoferrin, which prevents them from setting up colonies and producing a pathological biofilm. Lactoferrin promotes normal intestinal microflora. It has a unique, selective action – by inhibiting the growth of pathogenic intestinal bacteria, it does not reduce the population of the desired microorganisms from the Bifidobacterium family. What's more, similarly to prebiotics, it promotes the growth of beneficial gut microbiota. Lactoferrin shows antiviral properties. It helps to fight enveloped viruses (e.g. HIV) and non-enveloped viruses. It interferes with their DNA and RNA, which promotes the distribution of viruses and inhibits their replication. In addition, it protects against the contact of the virus with the body’s cells, and thus protects against infection. Lactoferrin improves the absorption of iron. It also helps to deliver iron to cells – it binds its ions and transports them to the inside of the cells, where there is an appropriate environment for their release. Specialists suggest that lactoferrin constitutes an effective way to increase iron levels. Unlike iron preparations, it is safe for the body and does not increase the risk of side effects. Lactoferrin has antioxidant properties. It promotes oxidative balance in the body and protects against the formation of excessive amounts of reactive oxygen and nitrogen species. As a result, it may slow down the aging process of the body and reduce the risk of developing oxidative stress-induced diseases. Lactoferrin promotes bone strengthening. It allows maintenance of a proper balance between the activity of osteoblasts and osteoclasts. Thus, it positively influences bone growth, protects against their demineralization and may prevent osteoporosis. In conclusion, Life Extension Lactoferrin Caps is a supplement recommended as part of general health prophylaxis. It is a good and safe alternative to preparations containing iron. In addition, it will be great for people with weakened immunity and will be helpful in case of recurrent viral or bacterial infections. Lactoferrin supplementation should last a longer period of time. It is assumed that for the strengthening of immunity it must be used for a minimum of three months. If the goal of supplementation is to regulate the level of iron in the body, it should last for about half a year. Lactoferrin works synergistically with many other compounds, so it can be boldly combined with any supplements. It can be used even during antibiotic therapy – it helps to strengthen the effect of the drug and itself has a strong bactericidal effect. Life Extension is an American innovative supplier of the highest quality nutritional supplements, including minerals, herbs, hormones and vitamins, present on the market since year 1980. Their mission is to find scientific methods of treating and preventing the diseases and effects of aging, what they included in their motto: "Stay healthy, live better". Microcrystalline cellulose, vegetable cellulose (capsule), silica, stearic acid. Magnesium citrate. It supports heart function, strengthens bones, prevents cramps and improves mood. Vitamin B6 is one of the most important nutrients needed to maintain good physical and mental health. Highly assimilable form of magnesium citrate, 100% of daily requirement in comfortable ampoules. Preventive healthcare for women. It reduces PMS symptoms.